A few years ago, a NYC photographer took a chance on a rundown space “Upstate.” It’s paid off for him, his clients, and the community. Photographer Aaron Rezny spends a lot of time thinking about change — the changing light in his photographic studio, the fading significance of everyday objects, and the recent transformation of Kingston, the city where his new studio is based. For Rezny, moving his studio to Kingston was as much about his love for the Hudson Valley as it was about a changing New York City, a place that he says has lost its soul. Rising prices have made it more difficult to be creative in New York City. After occupying his Chelsea studio for 30 years, Rezny didn’t want to renovate another space without buying the building. Kingston prices were attractive, and there was an energy in the city that drew him in; three years ago, he found the former Welch Industrial building to fit his needs. Transforming the dim, dilapidated space into a sunny, attractive studio recently won him a Friends of Historic Kingston Local History Award. It was a renovation that required both economic risk and artistic vision. It took vision to buy a building in Kingston’s Midtown area more than three years ago, when banks were not yet convinced the area was due for a renaissance. It took artistic vision to realize the possibilities inherent in the former manufacturing space. Despite conducting previous renovations on a Brooklyn brownstone, his Chelsea studio, and his Woodstock home, Rezny was not convinced the Kingston space would work out until he raised the ceiling, exposing supportive wooden trusses and adding skylights that infuse the space with natural light. 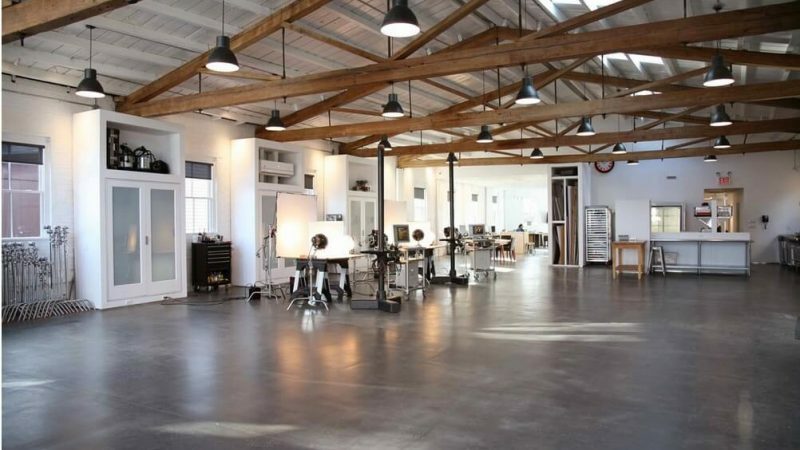 With a ground-level back entrance, the studio is so large that a car can be maneuvered in it. There’s room for work space, kitchen space, gallery space, and an upstairs loft. Outside, graffiti that was already in place in a former side alley now graces and highlights the new entryway. Rezny did briefly wonder whether his high-profile clients would follow him north, but he soon found out the studio was well received. Times change, he noted. Addresses fall in and out of fashion. Late last year, the studio hosted a nine-month photo shoot for a global package redesign for Gerber baby food that involved a team of retouchers, food stylists, assistants, clients, and the producer. A Kingston restaurant delivered breakfast and lunch most days, with an organic vegan spread delivered on “Vegan Wednesdays” by The Garden Café in Woodstock. This story was originally published in Hudson Valley Magazine. Photographer Aaron Rezny’s most popular model is food. This led to Eating Delancey: A Celebration of Jewish Food in 2014, which he photographed and co-authored with Jordan Schaps. The book is an homage to the food of Rezny’s youth, sharing recipes and food-based memories, some by celebrities such as the late comedienne Joan Rivers. The project started out with Rezny taking pictures of nostalgic food — pastrami, matzo ball soup — and when he spoke about his project, people shared emotional memories. Food from once-famous New York delis is not the only nostalgic photographic subject that attracts Rezny. He started another project called Game Show, which focused on the board games he played as a child while temporarily confined to a wheelchair. Two current projects are Obsolete, focused on items that have lost their relevance, and Survived, a Holocaust project that captures tragic loss in photographs of everyday objects — a gold ring, a lost watch, a uniform — each with a heart-rending story. The project is meaningful for Rezny, the son of a Holocaust survivor.